Rasor FP861 air operated pneumatic cloth cutting machine with 86mm (approx 3.4") shaped round blade and carbide counter blade. The heavy duty air powered motor, manufactured in-house by Rasor, is approximately 4-5* times more powerful when compared with a similar sized electric motor. It has a 400w equivalent power rating with high torque and remains small + light enough for hand held operation. The standard 86mm diameter 8-sided rotating blade, coupled with a lower counter blade, is particularly suited for use in the textile and technical fabrics industry. With a cutting depth of up-to 25mm it can cut several layers of materials including fibre glass and carbon fibre. 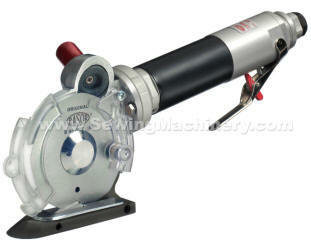 The high torque and low blade speed also offers capabilities when cutting rubber or rubber backed materials.